The top 200 Indian information technology companies logged combined revenues of $84 billion (Rs 384,250 crore) to achieve an average growth rate of 25 per cent in 2010-11, the highest in the last four years, according to an annual research by Cybermedia"s Dataquest magazine. The top 20 IT companies had revenue of over $1 billion leading to combined revenue of the top 20 companies at $54 billion, contributing to 64 per cent to the top 200 companies' combined revenue, the survey revealed. The revenues of these companies stood at Rs 307,126 crore in 2009-10 compared to Rs 289,093 crore in 2008-09, the survey 8 millionWorldwide Game Technology (IGT), the Nevada-based manufacturer of slots along with other machine-based casino games has launched their financial reviews on their own first quarter fiscal year 2013 performance, and wouldn&#8217t long, they struck large, posting its best first-quarter performance previously 4 years. said. 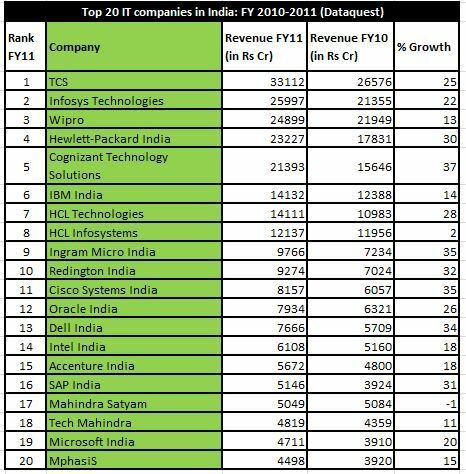 According to the survey, the top 5 Indian IT companies in FY11 were TCS, Infosys, Wipro, HP and Cognizant with revenues of Rs 33,112 crore (25% growth over last year), Rs 25,997 crore (22%), Rs 24,899 crore (13%), Rs 23,227 crore (30%) and Rs 21,393 crore (37%) respectively. The number six slot went to the Indian subsidiary of global tech behemoth IBM while No. 7 and No. 8 slots went to HCL Technologies and hardware-led HCL Infosystems. Mahindra Satyam took the 17th slot - making a re-entry to the top twenty after two years. Significant leadership changes have taken place at the senior levels in nearly one-third of the Top 200 IT companies. The survey took into account revenues of all tech companies from April 1, 2010 to March 31, 2011.